Leading Manufacturer of automatic vertical band saw machine, 400 v vertical band saw machines, hydraulic vertical band saw machine and manual vertical bandsaw machines from Pune. 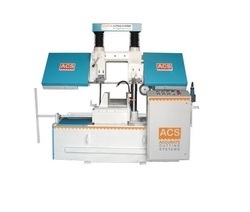 These Automatic Vertical Band Saw Machine are fabricated using latest technology and premium grade raw material. Available in different specifications, these can also be customized as suggested by the clients. Heavy duty gearbox for necessary torque. 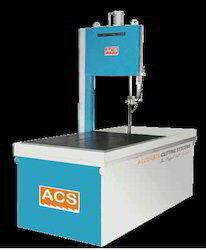 400 V Vertical Band Saw Machines can be used for cutting square or flat materials with different sizes of cross section from rolled blocks or rolled plates. These machine provide higher cutting with greater precision and speed. We bandsaw machine manufacturers, exports different models of vertical saw machines specially designed for operator's convenience. Hydraulic Vertical Band Saw Machine can be used for cutting square or flat materials with different sizes of cross section from rolled blocks or rolled plates. These machine provide higher cutting with greater precision and speed. We bandsaw machine manufacturers, exports different models of vertical saw machines specially designed for operator''s convenience.Hydraulic vertical band saw machine are robust in construction provided with hydraulic table movement & hydraulic blade tensioning. These machine are robust in construction. Available with 400 to 900mm throat capacity. 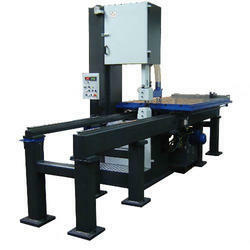 We are offering Manual Vertical Bandsaw Machines to our client. 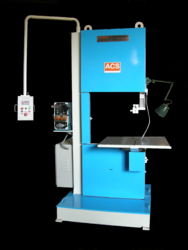 Looking for Vertical Band Saw Machines ?